Henry Holt & Company, 9780805042948, 32pp. Eye-popping paintings capture the scenery and wildlife of the Pacific Northwest in this energetic recasting of a favorite children's rhyme. 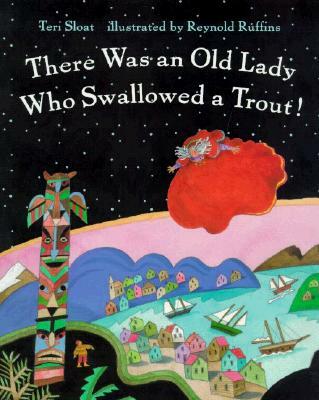 The buoyant text bobs along as the old lady swallows a salmon, an otter, a seal, a walrus ... until eventually she swallows the entire sea and the trout swims free This pure flight of fancy gives a fresh twist to a familiar song. Teri Sloat and her husband, Bob, moved to Alaska the day after they were married. They liked it so much that they stayed for twelve years. A former teacher, Ms. Sloat now lives with her family north of San Francisco, but returns to Alaska every year. Reynold Ruffins has illustrated more than twenty books for children. Among his numerous awards is a Coretta Scott King Honor for "Running the Road to ABC." He lives with his wife on Long Island.